Learn what's wrong with the way endodontics is being taught today, how your endodontic choices can change your marketing, and the single most important criteria for success. I have been an endodontist for 43 plus years. I founded a group practice of which I am still a full time member. About 30 years ago, we started a company, Essential Dental Systems, 34 years ago to improve and simplfy the placement of posts, the shaping and obturation of root canals as well as introducing a number of improvements made in other areas of dentistry. Through both the practice and the company I do a lot of continuing education specifically in endodontics giving dentists a broader perspective on the options they have available. 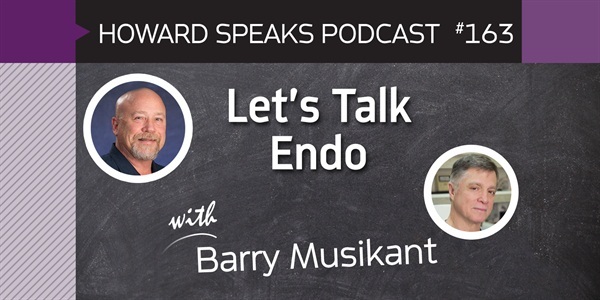 Howard:	It it a huge, huge, huge honor for me to be interviewing Barry Musikant, who is a legend in endodontics. You're a legend. The thing I love about you is you always ... One of my maxims that I learned from the book Beating the Street by Peter Lynch, he said everybody would stay in Wall Street and he knew the biggest investor in the world was Warren Buffett. He stayed in Omaha and didn't get caught up in all the Wall Street hype and all that. He had the same approach, instead of reading all these papers and 401(k)s and 401 quarterlies [and not 00:00:43], he would fly to a state and then, he would drive around all week and he would go visit the companies. He said, "I wanted to go into the company. I wanted to see if it was clean and organized, if it was friendly. I wanted to know if I walked in off the street if I could meet the man, the CEO, the one in charge. The ones who made a religion of availability and showed you the plan and talked to you in person," he goes, "Those were always the long-term investment strategies," and the companies he saw that were disorganized and not friendly and the CEO did not have time to meet, he says, "They always are taking stock." I'll never forget when I was in New York, I went to your office and not only did you invite me in and showed me around, but you spent hours with me on teeth and you spent so much time. It wasn't just me because I'm with Dentaltown or something. You do that to everyone. Barry:	I'm still doing it. Barry:	Yeah, [inaudible 00:01:53] teasing me about that. Howard:	I know. I'd be in the bar 10:00 at night and people say, "Yeah, I was just in Barry's room for three hours. That guy is amazing." You just eat, live, breathe, and die, and sleep endo. Barry:	One fellow, and I won't say his name, kind of said, he was making innuendos, funny innuendos, nothing nasty, and I said, "We're talking about endo, not innuendo." Howard:	Thank you for spending time with me. Tell people about yourself. Tell people your story. Number one, you're in the largest city in the world, in North America or United States and Canada, Manhattan. You're in New York, City, Manhattan. Howard:	Which I just read interesting stat that if the whole world, 7 billion people lived in the same density as Manhattan, all humans could live in New Zealand. Howard:	That's how dense Manhattan is and so, with all this massive competition, you're crushing it. How many endodontists are in your group? Barry:	Right now, we have about five. It varies, sometimes five, sometimes six. There's been a little variation. Howard:	How many days a week are you open? What are your hours? Barry:	We're open seven days a week. Howard:	I know. What a legend. My gosh. That's what Americans deserve. I was just in Australia and they're all whining that the government ... When I started lecturing there in the '90s and stuff, the average dentist would tell me they couldn't get in any patient for six weeks. Now, I'm back there now and they're all upset because the government opened up a bunch of new dental schools and let in about 1,000 foreign dentists. I kept telling them, "It's not about you. It's not about the dentists. It's about the patients. You weren't patient centered." In America, I'm in Phoenix, Arizona. You still can't find a dentist open on Sunday in a town that has 4 million people. What are your hours on those seven days a week? Barry:	We're open from 8 in the morning until 8 at night, Monday through Friday, and then on the Saturday, open until 5 and Sunday generally until 2, but if a patient comes in at 1:30, would stay maybe until 4. We're there to serve. That's how we make our living. We have to be consistent. We have to be humble and frankly grateful. The economy out there, gratitude and humility go a long way. Howard:	You have a legendary company, Essential Dental Systems, edsdental.com. You are a endodontist. What made you decide that all the files you could buy on the market weren't good enough for Barry Musikant and you decided to start doing your own file system? Barry:	It didn't exactly work that way. It really goes back to the University of Pennsylvania when I was student, undergraduate. Howard:	You were taught by the Quaker on the box of Quaker Oatmeal? Barry:	Yeah, that's the guy. Howard:	That's the guy? I never knew he was an endodontist. I'll enjoy my oatmeal even better tomorrow. Barry:	He knew his oats. He knew his oats. Anyway, the fact is, we learned in those days reamer, file, reamer, file, 10 reamer, 10 file, 15 reamer, 15 file. Howard:	Are you saying a reamer separately than a file? A reamer ... ? Howard:	Explain the difference in a reamer and a file. Howard:	Explain what that is because a lot of these kids, they never had a pocket watch. Barry:	Watch winding, every young dental graduate knows takes his K-file, goes in, and watch winds it. It's a horizontal motion going back and forth and you coordinate that with lifting up so you're engaging and pulling up. That works for a file. It's not very efficient, but when you use a file with all those horizontal flutes, you're engaging when you go horizontally and you're shaving dent in a way when you go vertically, right. Barry:	That's a pain in the neck. Also if you think about it, you got to put that instrument back in the canal, you probably got debris in that canal, even though you still got some irrigants in there, but as you work your way apically with those horizontal flutes, tend to clog the canal in the apical third. Many dentists say, "I'm doing great through an 8 to 10. Right around a 15 to 20, I'm starting to lose some length." You can say that's just your skill factor and certainly, there are certain people that could do a great root canal with a pitch fork, but when you have an instrument like a K-file with all those horizontal flutes, the tendency to pack debris apically is much higher than if you use an instrument that has vertically flutes. When you put that back in the tooth, tends to glide past the debris because you don't have horizontal flutes, you have vertical. It's something, it's just visual if you see it and it just makes all the sense in the world, plus the fact when using a ream, you got half the number of flutes along the length so you got less engagement to start with. There's that reamer with the vertical flutes, you do your first clockwise stroke as part of your watch winding. Not only do you have half the number of flutes, which means there's less engagement, but with that first clockwise stroke, you're immediately shaving down the way. All of a sudden, less engagement. Less engagement for two reasons, right. Fewer flutes, you just shave a little way, let's you get to the apex easier, less likely to impact debris. That's what I learned right off the bat. For me, it was forgetting K-files. Let's get into reamers. For me, it's the most natural thing in the world. In fact, if you look at the new products that the major companies are coming out with, their new glide path instruments are all with vertical flutes. They were all designed as reamers. They call them files, but they're all reamers. Howard:	Just to be clear, first, you said reamers versus files, reamers or files, and then all of a sudden, you said K-file. When you originally said reamers, files, you meant K-file? Barry:	Yes. When I use the term files, it's generally a K-file type of design, which means by definition, predominantly horizontally-oriented flutes. Does that make sense? Howard:	It makes sense. You also threw out the term, " and irrigants." What irrigants would you be using? Barry:	We're typically using sodium hypochlorite, although I do steal a bit from [Steve Buchanan 00:08:52]. When I have a vital tooth, the first irrigant I'll put in is 17% EDTA because the 17% EDTA does not cause the pulp tissue to get tougher. In other words, when you use sodium hypochlorite, it cooks it a little and it makes it a much more difficult tissue to remove from the canal. In a non-vital case, sodium hypochlorite digests non-vital tissue beautifully. Howard:	What percentage of the bleach are you using, sodium hypochlorite? Just straight out of the bottle or do you dilute it? Barry:	I'm [using 00:09:25] right out of the bottle, 6% for the most part. Howard:	Six percent straight out of the bottle? Barry:	Yeah. Just make sure it doesn't go over the apex. Howard:	Yeah, yeah, that's [crosstalk 00:09:35]. Continue on your journey. You got out of Quaker Oatmeal, ended on a school in Pennsylvania. Howard:	Can I stop you right there? Howard:	My job is to ask questions that the viewer might not have got. Explain what you meant by straight-line access and the difference between a Peeso and a Gate. Barry:	Straight-line access today is understood as trying to gain entry into the canal orifice by going through as little curvature as possible. The reason for that is because the big bugaboo with rotary NiTi to this day with all the new products that have been introduced is one of separation, unpredictable separation. They know if you can get straight-line access, there's less chance of cyclic fatigue, which is one of the causes of fracture. Then the other thing of getting a little bit greater taper, it reduces your chances of [being engaged 00:10:55] along length, reduced chance of tortional stress that can also lead to instrument separation. See, that's the problems inherent to rotary NiTi because it's rotated. See, the other thing that I like about the way I do things and what I'm always talking about is keep your arc of motion small. Use a 30- to 45-degree reciprocating hand piece, all of a sudden, you don't have tortional stress and cyclic fatigue, not worth enough that you're ever going to worry about breaking an instrument. Now once you don't break an instrument and you know you're not going to break an instrument, your whole mentality changes because you can take an 06 reamer, 02 tapered, 06 ream, very thin, and now because you know because it can't break, you can work it aggressively buccally and lingually. That's very important because most canals don't turn out to be round in cross section. They turn out to be oval in cross section, at least for a major portion of their length, sometimes all the way down to the apex. That's not the exception, that's more the rule. It's only a tooth like a maxillary central incisor that tends to be conical the entire length. If you're conical in the entire length and it's nice and patent, it's broad, by all means use rotary, be a happy guy. Just that's not reality for most teeth. Howard:	Most endo is on molars, not incisors. Barry:	The two central incisors, maxillary incisor represent 1/16th of the teeth in our mouth. The rest of them are looking a little more complicated. Barry:	Peesos are parallel-tapered instruments that have a non-cutting tip and they're not there to deepen a canal that hasn't been deepened by other means. It's just to widen and selectively remove dentin from one wall or another. In other words, if you've got a C-shaped entry into an orifice, it would be much nicer if you can straighten that C up. You follow? Barry:	Once you can straighten up the entry into the canal and you're using a rotary instrument, you're going to be far less likely to subject that instrument to torsional stresses and cyclic fatigue. Think about it. Let's say you've got a coronal curve, then you've got an apical curve. Oh, man, that rotary NiTi instrument is negotiating two curves. We know that the instruments are much more subject to breakage in that type of environment and that's because they are rotating in that canal. You follow what I mean? Barry:	When you're subject to that kind of stress and you have a high incidence of fracture, what you want to do is take steps to alleviate that. That's where straight-line access came from. That's where crown down came from. Crown down endodontic preparations widen the canal first with a bigger, a greater tapered instrument and then, you go in a little deeper with a lesser tapered, a little deeper with a still lesser tapered. Why? Because it's not engaging the full length of the instrument and it allows the tip of the instrument to have a better tactile sense and not be subject to the stresses of full contact along the entire length of the canal wall. Crown down lets you reduce the contact along length when you're doing rotary NiTi. This is of practically no significance when you do short arcs of motion as you do with 30- to 45-degree reciprocation. Howard:	Then the difference between Peesos and Gates? Barry:	Yeah. You could say that a Gates is like a short Peeso. It's just a little nub of an instrument and it too has a non-cutting tip and it's just a way to get down the canal, widen the canals a little more. A Peeso is much more efficient at straightening a canal wall. The Gates-Glidden has a more flexible shank, but you still got to worry about it breaking if and when it takes a curve [crosstalk 00:15:13] curve. Howard:	I want you to give a father-son, father-daughter talk. It seems like whenever I'm in a dental office and someone can't get out a wisdom tooth, I couldn't get out either with their flap. I can't see a damn thing. They got this little bitty flap and I go in there, and the first two or three minutes, I'm just making the flap bigger so I can see it and get out. Same thing with endo. You still see people doing an endo through the hole the size of a BB on the top because they're trying to preserve that crown. I always take the crown off and throw it away and to me, it's just so much easier and predictable to just redo the crown, get the crown off, get a nice access so you can see. It makes the tooth 2 millimeters shorter. Howard:	How big of an access will you do? Will you try to make a smaller hole as possible through that porcelain crown or will you open it up for straight-line access? Barry:	Yeah, I'll try to make a small access, but my final judgement for the access, whatever it is, whether it's large or small is I've got to find the darn canals. You know on Dentaltown, there's all this discussion about minimum access and even just making two separate openings for the distal and let's say the mesial. Maybe there's some immensely skilled dentist who can do that, but I will tell you I try to be as conservative as possible. I don't routinely make openings like that. I have to see the canals. Frankly, on a lower molar where I need direct vision to look in, I may have to bring my opening, my access up onto the mesiobuccul cusp a little bit. I've got to make sure I see everything. That's just basic stuff, but obviously, I'm using a [microscope 00:17:52]. Howard:	Then when you're done with the endo and you've gone through a crown, what do you think is the best sealer material to go back and seal that hole? Are you ... ? Barry:	It's funny, if you look at the fellows on Dentaltown, a lot of them use amalgam. I got away from amalgam. Not that I think that it's anything bad, it's just I'm a creature of popular culture too so what I tend to do is I'll end up sealing the canal when I'm done. If there was a crown on there, a layer of glass ionomer. That's it. Then, I'll etch that. After I etch that, I will bond a Herculite to it. That's what I typically do, unless of course I made a [post over 00:18:30], which in case I'm putting cotton and glass ionomer along. Howard:	That would be a sandwich technique to have glass ionomer then a resin composite. Why would you put the glass ionomer on the floor? Barry:	Just something I got used to. If you asked me why don't fill the whole thing up with composite, I think glass ionomer has got a pretty good bond in and of itself. On the other hand, I think the Herculite bonded to the glass ionomer and the surrounding walls is pretty good. I could do a lot of different things. Barry:	Jesus, you got me. Howard:	Herculite, is that Kerr? Barry:	You want to know, I use it everyday and I don't know. I'm guessing it's Dentsply. Howard:	I'm sorry to keep interrupting you, but continue on your journey. You got out of Pennsylvania. You're using reamers and files, straight-line access, Peesos and Gates. Howard:	How did you go from there to Essential Dental Systems at edsdental.com? Barry:	The first part of Essential Dental Systems may have had very little to do with root canal. It was the Flexi-post, Flexi-post, Flexi-flange and the whole idea was we started lecturing about posts and basically, posts were either passive or active. If they're passive, you only had the retention that the soluting cement gave to the post, right, but you didn't have too much stress because you put it in, it's passive. It's a passive placement. Insertional stresses were next to nothing, but you didn't have a lot of retention. On the other hand, we want a lot of retention, but the only way to get a lot of retention is with a [thread 00:20:19]. If you get a lot of retention with a thread, traditionally and common sense logic says you're going to create insertional stresses when you screw that thing in. You do get more retention, but then you got a lot of stress, and we're all worried about breaking roots and that was way before we worried about breaking roots with greater tapered preparations. This is just with posts. What do you do to solve that problem? It was just the insight we had. If we put a split up the center of the post then when you screwed it in, it acted as a graduated tap, which meant that each thread incrementally got deeper, but it did not create an overall huge increase in the amount of insertional stresses. You had minimal insertional stresses, but you had very high retention. Howard:	That was your first product. Barry:	That was the first product. Howard:	When you said we thought, who was we? You and who else? Barry:	Allan Deutsch and myself, Allan and I started Essential Dental Systems. Howard:	Is still your partner with that? Barry:	Yeah, he's just not here today, but he's my partner. Howard:	What year did that start? Barry:	I think it was back in around 1981. We actually got the idea back in 1977, but then, we did about five years of testing at Memorial Sloan Kettering. We had five papers I think before we ever became a formalized company and it worked. The concept works and I think that's why it's still a very popular product. Howard:	Did you patent it? Barry:	Yeah, we patented it. Howard:	How long is the patent good for, 17 years? Barry:	Yeah, I think so. Frankly, honest to God, I don't even think about that anymore. Barry:	I just keep going because we keep developing new products. Howard:	Are you still selling a lot of Flexi-posts today? Barry:	We're selling more today than we did years ago. Howard:	Why do you think that is? Because of the split up the middle and less ... ? Barry:	No. I think because people see that it functions and intuitively makes sense. If you take a solid shank post with a thread, parallel let's say, parallel screw, you screw it in, you're going to have a lot of resistance. You're going to be cranking that in. Common sense tells you, you're generating a lot of stress when you screw that thing in. You do the same thing with a split shank post, goes in easily. Howard:	What are you cementing it with? Barry:	We use a Flexi-flow composite, a flowable composite. Howard:	This would be a perfect time to review. When does a tooth need a post? Barry:	My attitude is really when you make the judgement that you don't have enough coronal dentin to support the core build up. If you have enough and you got three walls, I don't think you need a post. You put in a bonded composite. Let's say you take a maxillary central pretty much down to the gum line, there are some people who would say place an implant. I think that's crazy. You've got a good tooth. You've got maybe 16 to 18 millimeters of length, you make your post hole, you put your post in, stable like a rock. You build a core over it and you got a restoration with a nice [ferrule 00:23:43] that's going to last a life time. Howard:	Explain what a ferrule is to a listener who missed that. Barry:	A ferrule is circumferential support. It's a margin that goes around the tooth that grabs ideally 2 millimeters' worth of peripheral tooth structure. They would call that a ferrule. It's probably the single most important thing in stability of a restoration. Barry:	Yes, evidently it means different things. Howard:	Barry, when we're talking about a post and how far you would go down, obviously, the back morals are just dealing with up and down force. Those incisors are dealing with up and down and lateral forces, sheer forces. How far down do you put a post on a posterior teeth and how is it different on a maxillary central incisor, that tooth's getting hit three different ways? Barry:	A maxillary central incisor, first of all, if you've got a lot of tooth structure ... You're saying when there's no tooth structure? Barry:	Again, it comes back to the ferrule. You've got to have the ferrule. You better make sure, let's say it's a maxillary tooth, you'd better make sure you've got a good lingual parallel wall as part of that ferrule because if it tends to slip off on the lingual, then you'd start loosening the crown. You've got to not only have a grabbing 2 millimeters, but you better make sure that what you're grabbing at least on the lingual is pretty parallel. Howard:	Maybe feral is the right word because the definition is existing in a wild or untamed state so that would be you want 2 millimeters of tooth that's existing in its wild and untamed natural state having returned to an untamed state from domestication or suggestive of a wild animal. Yeah, the feral is everything. You think 2 millimeters on a molar is all you need on person's anterior? Barry:	A molar's a different story because usually the orifice on a central incisor's right on that flat. It's right on that flat, that broken down tooth down to the gingiva. You take a molar, most often from my experience, the pulp chamber is recessed into the body of the tooth. You may still have a few millimeters without really going very deep for a [collar 00:26:10] of tooth structure. You may have that existing on a molar. If you got that and you've got some wall standing up and that pulp chamber is quite deep, you just may be able to build up with a bonded composite again because it's going to be very easy to grab 2 millimeters of ferrule and it doesn't have to be deep under the gingiva. Does that make sense? Howard:	Yes, absolutely. I think you're a gifted teacher. You make everything make sense. That was your first product. You started that in 1977, got it out in '81. What was your second product? Howard:	Safesiders' only 12 years old? Barry:	About 12 I think. Yeah, yeah, I think so. Howard:	Really? When did you launch that, in 2003? Howard:	Yeah, the Townie Meeting. Barry:	Yeah, I was laughing because I remember a story you told when I gave my lecture and I'm talking about all the good things and you told me you were sitting next to this woman dentist and you said, "Gee, it sounds great." She says, "It can't be that good otherwise everybody would be using it." [Crosstalk 00:28:08], then you go, "There's marketing." Howard:	You graduated from endo school in '69, right. Barry:	I got out of my residency. After I graduated in '69, I had a year of internship. Then I had a two-year endodontic residency. I got out of my endodontic program in '72. Howard:	You got out of your endodontic program in '72 and then it took clear to 2003 so that'd be 23 ... Why that many years later, what made you come out with the SafeSider? Barry:	Actually, what made me come out with the SafeSider was the introduction of rotary NiTi. This is the way I perceive it. It's a personal thing. Now you got to realize, I was using reamers. I was very comfortable with Peesos. That's a manual usage of reamers, not files, and I supplemented that with various Peeso reamers. I was okay, but when rotary came out and it was backed by the major companies, you very quickly felt like boy, if I'm not using all this new stuff, I'm going to be behind the times. I bought my various systems. Anyway, make a long story short because it goes back a number of years, I found that being 20 years out and instead of being a nice young 30, I'm now 50. Somehow, I lost my youth and I'm saying, "Something's not right here," because now that I'm using rotary NiTi, I didn't break many, but I broke an instrument here and I broke an instrument there, something I was never worried about when I used hand instrument. Even though I broke them because if I occasionally broke a hand instrument, I knew exactly why. I simply had screwed it into the tooth too tight and continued to rotate clockwise and I broke it so I knew why. Howard:	Say the price of ... How was a file and then, how much was a rotary file? Barry:	A reamer in those days, stainless steel, probably under a buck. I don't remember what rotary equipment, but it was several times that caused ... Then shortly after, not immediately, originally, when rotary NiTi was used, my memory was that they recommended several uses, but that quickly changed to single usage. It's funny, I just wrote an article on the problems with complex systems. I think of rotatry NiTi as a complex system. The reason is because when it fails there are several factors and we have to address all those factors. When you get to failure, you don't know what factor to blame it on. It's the very definition of a complex system. I want to get away from complex. I like simple and robust. I found frankly that first, because when we first developed the SafeSiders, it was a manual system. It was watch winding, but there were still short arcs of motion. Then somewhere along the line, we got the idea why don't we, let's see if we can adapt this to a 30-, 45-degree reciprocating hand piece. It adapted beautifully, it just adapted beautifully. As soon as I had that, I couldn't break an instrument if I wanted to. I took these instruments out to [Gordon Christensen 00:32:02], Jesus, he just tried like crazy to break them and he couldn't do it. Howard:	Thirty five degrees, that would be circles 360 so 1/10th of a circle? One-tenth ... ? Barry:	It was, what was it, 30-degree reciprocate. See, it's between a 12th and an 8th of a full rotation. Howard:	Between a 12th and an 8th. Barry:	Right, but either one is insufficient to produce enough torsional stress or cyclic fatigue to lead to instrument separation. That's not to say you couldn't take the instrument manually and break it. You can break anything manually. That's another interesting point because the only instrument I typically use today when we use the SafeSiders and because we've actually gotten beyond the SafeSiders, I'll explain that shortly, but the SafeSiders starts with an 02 tapered stainless steel reamer, which you can imagine at that dimension is as flexible as you ever need. Howard:	What's that made out of? Barry:	Stainless steel. In fact, everything that is 02 tapered is stainless steel. There's no reason to make them out of nickel titanium. The 02 tapered would be way too flexible. Howard:	What is stainless steel made out of? Barry:	Stainless steel, there's a whole bunch of different stainless steels, but the ones we have are very rugged, easily sterilize-able. They don't lose their edge. They just last a lot longer. My point is I think the first instrument manually and because it's a reamer design, not a K-file, I get down to the apex pretty quickly and I take my measurement with my apex locator, right. Barry:	Let's say I'm 22 millimeter to the apex. I'm happy with the measurement. For the most part, that's the last instrument I use manually. Not only do I do the entire shaping of the canal with an engine driven system that gets rid of any hand fatigue, but I start at the actual beginning of the glide path. Typically, the glide path was always done manually to a 20. They said 10, but in reality 10 to a 20, and then you would incorporate your rotary NiTi systems in a crown down manner or some version like it. When you do reciprocation, I'm not looking for crown down. I'm going from thinner to thicker. It works well. You'd say, "Gee, aren't you going to have a stiffer instrument by the time we're up to a 20 or 25?" Then I say, "Yeah," but as I'm getting there, I'm going up through a sequence of instruments of stainless steel and don't forget, they have a flat on that. We have a flat, that's the style of the SafeSider, flat along its entire length so it's even more flexible and it's a reamer, which is still more flexible, but I'm creating, I'm constantly defining the pathway better and better. I had a struggle let's say with an 06 was a very tight canal. When I put the 08 in, it practically falls in. I work it buccally and lingually because I know that's where the canal is broader [inaudible 00:35:10] and the mesial root of a lower molar, I probably don't have a round canal or I have a round one with a lingual extension, right, a buccal-lingual extension. I want to get those extensions because they may look very thin in the tooth, but they're loaded with bacteria. From the bacteria's point of view, it's a [inaudible 00:35:28]. I want to get all that stuff out. I can do it, why, because I'm not worried about the instrument breaking. When you worry about an instrument breaking, you stay centered. When you stay centered, you're not worrying about the buccal and lingual extensions. What you're really worried about am I going to have a pretty picture of my mesiodistal periapical x-ray. More times than not, it looks good, more times than not, it works, but we're also using greater tapered instruments that in my mind, by the time you go beyond an 04 taper, maybe many times an 04 taper's even too great, you're taking away too much tooth structure in the mesial and distal because we've got such things called furcations that occur on the inner roots of mesial roots and also distal roots, but most prominent mesial roots of lower molars, that and before you even prep the canal is thin as can be. Barry:	The flat side, there's two things, it makes the instrument more flexible, but it also leaves room for debris, leaves room for irrigants, right. In other words, even if you took a regular reamer and you put that in the canal, it's going to work pretty well. It's going to work a heck of a lot better than a K-file, but it's not going to work as well as a reamer that's got a flat on it. Now, we've got some new products we're developing and it always incorporates that flat and that is the secret because when we first tried various things, we'll try different patterns, we'll get an instrument with certain configuration and we'll put the flat on ourselves. Just take a diamond disc and just work it down and you've got yourself your flat. We see the difference immediately. It makes for a profound difference and it's beautifully adapted to 30- to 45-degree reciprocation. This is not going to break. Howard:	Also just for our viewers, how many root canals do you think you've done in your lifetime? Barry:	We've extended it. It's interesting that you mentioned it. What happened was we're to a certain extent responsive to what happens in the market place. What did we see? First of all, you had all these rotary systems coming out. Then all of a sudden, there's so many, they all have to be replaced after one visit. It's a very expensive procedure. Then comes their form of reciprocation, which is what I call non-linear rotation. You know what I'm talking about when you talk about things like WaveOne? WaveOne still generates 200 full rotations per minute, but there's a reciprocating quality to it, except it's 150 degrees in one motion, 30 degrees in another. Every three cycles, you gain a full rotation. Since it's used at 600 revolutions per minute, you're still producing 200 full cycles, which can lead you to the torsional stress and cyclic fatigue, but after you gain access I guess at 15 or 20, they'll tell you that may be the only instrument you need. All of a sudden, we're seeing systems that require a lot fewer instruments. The SafeSiders are great from the point of view of not breaking, but after the glide path, we were still instrumenting up to a 35 or 40. We're still maybe six or seven more instruments. We said, "We can do better than that. We can do better than that." What we did is over the last year, we developed the Tango-Endo system. Now the Tango-Endo system represents two relieved reamers used at a 45-degree reciprocating hand piece and we use them after we gain our glide path to a 20 using the original SafeSiders. Like I say, we don't get hand fatigue on that because that's all done engine driven with our 30-degree reciprocating hand piece. Now you use these two instruments. The first instrument is a 30 02 and what we learned when you use this instrument with the flute design we have on it, you can go from a 20 02 to a 30 02 automatically. No problem. Works time and time again. Then you can go from a 30 02 to a 30 O4 just using one more instrument. In effect, we've gone to a 30 04 using two more instruments after a 20 and that gives us a greater prep than the WaveOne apically. We take away less tooth structure mesiodistally. Of course, it's a 04 taper rather than an 08 taper. More importantly, and here's the key because we do a reciprocation, I'm working those instruments like I do every instrument in my reciprocating [hammer 00:40:55], I'm working them vigorously buccally and lingually. Nobody's been doing that with rotary NiTi. Sometimes, I'll brush against the walls. That's kind of a wink. You're not brushing aggressively. Not only that, if you ever hit a bifurcation or you hit a merging point, you worry about the instrument breaking. Of course, it binds and breaks in rotation, but if you're not doing rotation, you're safe. You see how one feeds into the other? Howard:	Who was the famous prosthodontist that taught implants and I think he ended up in a green laboratory in Arkansas before he passed away? Howard:	What I loved the most about him is his lectures were always on all the cases that he did that failed. Howard:	You go to every endo course and dental course and whatever, and they're just showing their greatest work they ever did. Howard:	In the cosmetic arena, most of it's Photoshopped. The point I'm trying to make is that when we get to breaking files, that's a secret. Dentists don't go to the bar and tell the other three dentists they had broke a file. It is something I think that's I'm sure it's under reported. Barry:	It's funny because I've been on various websites where they'll say breakage is not a problem anymore. Maybe it isn't that big a problem, but I will tell you this. When I speak to dentists, I don't ask them if they break an instrument. I say, "Do you worry about breaking an instrument?" "Oh, yeah. I'm always worried." They're not saying they're breaking a lot. I don't want anybody to even have that fear because it limits the way the instruments are used. They're used more conservatively, which mesiodistally would be fine to me because I think we're always overpreparing mesiodistally, but they're not preparing the canals buccal-lingually. Howard:	Speaking of preparing the canals, how do you think the dental schools are preparing the dental students for endodontics? What do you think of their curriculum of how it's taught in America? Barry:	Here's where I really get more controversial. Howard:	I love it. I love that Howard Speaks Podcast is controversial. Barry:	No, no, I think because I've seen too much of it and I have people look at me straight in the face and deny it. The fact is if a major company, and I got to be very careful not to mention any company, but if a major company for argument's sake contributes $0.5 million to a program, what they're contributing to is the exclusivity of that, that students are not going to be taught anything but that and the school is obligated to take steps to make sure that even over lunch time, you don't have a sales man coming in showing an alternative point of view. The deal is made. This is my opinion. I believe that's the case. I have seen examples where, I could talk about myself, that I've been denied access because they already bought into the program. Howard:	Yeah, I lecture in a lot of dental schools every year and I mean I'm thinking right now at University of Tennessee in Memphis. You walk right in the endo department and there's Tulsa Dental product's name right on the center, donated by. Barry:	Let's say you came from [inaudible 00:45:03], would they let you lecture? That's the big question. Howard:	Yeah. I don't know. Barry:	It's okay. I think it's fine for schools to take money, but there should be no limit and there should be complete openness that they're telling their student body where they're getting their funds from. That's the problem today because there's a dichotomy. The schools talk about honor, character building, and it's very important. My father was a dentist. I still feel like he's over my shoulder looking at me. Howard:	You're father was a dentist? Barry:	He was a well-known dentist. He was part of a group of dentists that were the first ones that porcelain fused to metal. They were the first ones in the world. I grew up in a very unique dental environment. I was seeing movie stars when I go to my father's office when I was 9 years old. Howard:	He was the original Larry Rosenthal? Barry:	Let's put it this way. You just opened up [inaudible 00:46:06]. My father was a straight, quiet, easy going guy. I don't think he had a promotional bone in his body. He just got these skills and due to a certain ... At first they worked for somebody else and when the four top guys went off on their own, the entire practice followed. They had to go off on their own because the guy who was paying them a salary got less predictable in paying it. Barry:	Yeah, he's a nice guy. Howard:	I was wondering how does he get all these big cases. I'm watching him. He's got his own lab, [inaudible 00:46:47] veneers. Unbelievable. Then afterwards, he said, "Hey, let's go to dinner." On the way from his office to dinner, we stopped in his Porsche in five or six different clubs and he's walked in there, kissing 80-year-old ladies and hugging them and saying, "Oh, Margaret, oh, my God, when are you going to come see me? You'd look 10 years younger if you whiten those teeth," and he's talking to some 89-year-old lady in a walker. Said, "Oh, my God, if you got veneers, you'd look 20 years younger." They were just lining up at his doorway to get $50,000 veneer cases. Barry:	That's his nature. People pay a fortune to learn how to be like Larry, but you have to be born Larry Rosenthal. Howard:	Yeah, you also can't be short, fat, and bald. You got to be good looking and have a lot of hair and drive a black Porsche. Barry:	You got all the qualities. A very nice fellow when you talk with him. I've seen him and I don't see any airs about him. He's Larry Rosenthal. Howard:	Yeah, he's got more energy, an amazing guy. Did you say everything you wanted to say about your SafeSiders versus your new products? What are your new inventions? Barry:	Safesiders was an extended system, but we're now cutting it back pretty much when we introduce it to new people. People who use the SafeSider, they're happy with it, they don't want to change. If we get new people, we tell them that the creation of the glide path is a function of the SafeSiders and then, the two new instruments, the Tango-Endo, again, used in a reciprocating system, really for the most part shape the canals to a proper dimension. Don't forget, when you do rotary NiTi, if you put in let's say a 30 08, you're going to produce a 30 08 hole, right, mesiolly, distally, you're going to superimpose that shape. When I put in a 30 04 or any of my other instruments, I'm going to do something bigger at least in the buccal-lingual dimension than a 30 04 because I can work it aggressively laterally and that is a key point in my mind to have conservative preparations mesiodistally, but remove more tissue buccal-lingually. Howard:	Where does that name come from, Tango? Isn't that a dance? Barry:	That came from the marketing department. Barry:	It takes two to tango. Howard:	Takes two to tango, very interesting. I also want to tell you, everybody in endo says, "It's what you take out of the infected tooth, not what you put in, not what you obturate." I think of you as the post, the file system. Talk about obturation. How significant is that? What are the main ... ? I imagine you've probably done 30,000 root canals. Am I about right? Barry:	I think more. I think more, more like 50,000. I once tried to figure it out because there were many years that I worked like 70 hours a week. I must've turned out ... There's got to be a 20-year period where I did close to 2,000 root canals a year. I was so happy I was making a living, I thought I was going to be a bum. I turned out to be an honorable citizen. Howard:	It's probably 80% cleaning and shaping and 20% obturation. What are your thoughts on obturation? Howard:	I know you are. Barry:	I love reading the research. A bulk, a large bulk, nothing's consistent 100%, but a large bulk of the research says one, rotary NiTi, be it continuous or interrupted, produces micro cracks. There's a large body [inaudible 00:50:57] from in vitro examination of teeth. It's done via micro CT scans. They're all showing that you get these micro cracks. There was other research that shows that now that you've got these micro cracks, lateral and vertical condensation exacerbates it, which makes sense. You go in with a metal spreader and you're really going in hard to create space and to adapt cold gutta percha, you're going to use a lot of force. The problem is gutta percha's a rubber-like material. After you adapt it and you take the pressure off this rubber like material gutta percha, it rebounds, right, it rebounds. It rebounds after the cement has been displaced. When it rebounds, you tend to get a void and the whole reason for doing all this pressure is you can put in [extra point 00:52:01]. That's so much for lateral condensation. I'll do some lateral condensation here and there. Generally, I do a single point, but it's based on the premise that I can flood the canal with an epoxy resin cement. It's like an AH26 type of cement that I like. Howard:	What's the name of it? Barry:	We have our own. It's Easy Fill cement. It's essentially epoxy resin. Why I like that is because the research for years and there's a tremendous amount of research that shows it's [dimensionally 00:52:28] stable. It bonds to dentin. It bonds to gutta percha. It's highly penetrable into the dentinal tubules. It's also antibacterial. It's highly resistant to hydrolytic degradation. It's got a lot of nice properties. The point is I'm flooding the canal with the cement using what we call a bi-directional spiral, which is an applicator that allows us to really flood the canal with cement without driving cement for the most part over the apex. Then I take a pre-fitted point that I fitted with tugback at the right length and I coat the [dickens 00:53:02] out of that. I put that in the canal when I put the point in, you see excess cement come out. If there was anything close to a tight fit, I'm done. I [seal 00:53:13] that off and I'll take an X-ray and have what appears to be a nicely well-filled canal. Obviously, having done this for years, people are not coming back with terrible failures. That's what I would rather do and sometimes, I'll do lateral condensation, but I'll never use more force on the spreader than the weight of my hand. In other words, I'm going in passively. If I get some space, I can put another well-coated canal, fine. I seal that off. I'm done. I like the single-point technique or the way I just described the lateral condensation over thermoplastic, which is something I never really understood because when you do thermoplastic, you're warming it up to maybe 201 degrees C. You put the point in and then it shrinks back. It has to cool to 37 degrees, body temperature. There's certain laws of physics that you can't get away from. Howard:	Who is our common friend, the biggest fan of thermoplastic that I went to school with? You remember Joey D? Joe [Duffkin 00:54:21]? Howard:	He used to call himself the endodontic squirter. I roomed with him in Swanson Hall at Creighton University. He passed away last year, but oh, my God. He loved that. That was so technique sensitive. Barry:	That's my point. In a certain sense people fall in love with complexity because if you master that complexity, you feel like you're more of an artist. I think that's great. Man, the more talent you got, but I believe apply whatever talent you got to simpler systems that allow a higher level of predictability without having to have this super A game always available. It's just a different way. I'm not suggesting anything less than the highest quality of work. I'm saying there are far simpler ways to attain the highest quality of work. For that, we sometimes get into prolonged discussion. Howard:	Let's get into prolonged discussions. Are you tight for time or can I go into overtime with you? Barry:	You can go as long as you want. I'm going nowhere. Howard:	I ask you, when you're an endodontist and you run an endodontist practice, what percent of your root canals are retreats would you say? Barry:	Thank God most of them aren't our retreats, but we're doing ... Although we [inaudible 00:55:58] some of our own, I got to say it's got to be at least maybe 50%. Howard:	The United States has 4,000 endodontists. They're working 2,000 hours a year and they're doing 50% retreats and then over here, you got 125,000 general dentists who all swear to God with their hand on every bible you can think of, "Knock on wood, I've never had one fail," something doesn't add up. If the general dentist never had a failure and 4,000 endodontists are spending half their time retreating root canals, are these all just ... ? Is your practice limited to just immigrants from other countries who had root canals done in Zimbabwe? Barry:	One of the things I've learned and not a little bit from your website, people are human, people are human. We all have our strengths and weaknesses. We have a large tendency to remember things that are positive about ourselves. Barry:	You know what, I've learned to deal with that. Barry:	No, root canals, no implants. Howard:	I mean root canals. Howard:	Barry, dentists love lists. They love the top three, the top five, the top 10. Even the 10 commandments are hilarious because it's not even 10 commandments. Not covet thy neighbor's wife and thou shall not commit adultery, that's the same thing. Thou shall not steal, shall not cover thy neighbor's goods, same thing. If you could give us a list of top three, top five, top 10, why do root canals fail? Barry:	I think one of the reasons they fail and it's probably the most obscure is vertical fracture. There's a fracture in there that you just didn't ... Maybe you didn't see it even before you did the root canal or maybe you induced the fracture that was a partial fracture and then, under function over years, it propagates and becomes a full vertical fracture. You lose a tooth there. Why else? The external restoration is failing. You're getting leakage. Once you get leakage in and the bacteria are insidious, you can have had a root canal, you can add some good seals, but over 10 years, they migrate from the saliva underneath the margin, work their way through maybe whatever filling you had covering the tooth and gradually work their way down the apex. Then there's another thing. A lot of cements in previous years were what they call particulate cements. You have things like zinc oxide eugenol, it's a particulate cement, as soon as water hits that, it starts dissolving it. Your water hits something like epoxy resin, it's probably much more resistant so it can break down. Anyway, it could be 10 years after you did a root canal [inaudible 00:59:01], it's beginning to hurt me. I'm biting on it. It annoys me a little bit when I lie down. That would be another. It's leakage, maybe frank decay, breakage. What did I say? I said vertical fracture. Those are ... What's another thing? A missed canal, a missed. You had some of those conservative preps or you just can miss them. People tell me that there's 90% [MB2s 00:59:35]. I'm a compulsive. I use my microscope. I take my time. I'm not in a rush to do single visit. I do many two visits, occasional three visits, and I don't always find an MB2 in a maxillary first molar, but I may have missed it. Patient comes back 10 years later and darn if they don't have an [area 00:59:58] on that mesial root. At which point, I'll look even deeper and then on occasion, on occasion, when I go back in maybe several years later, I find the darn thing. You're working within very narrow parameters and maybe you should've gotten that extra little millimeter or so originally, but it didn't seem like it was something you should do at the time. Howard:	Barry, interesting how the first thing that came out of your mouth when we talked about endodontic failures was fractures. That's the first thing you said. I swear on the ... Dentists post pictures all the time. They're confused because they take out a MOD amalgam and they see a line from the mesial to the distal and it's black. Howard:	They're going to do an endo. They're always asking, "Should I do the endo? Should I ... ? " Talk about what you see clinically when you see a fracture. You say, "No, this is not going to work. This needs to be extracted," versus "This is manageable and we can have some [successes 01:00:58]." Howard:	That's exactly true then. If the fracture's on the roof, then you'll do the root canal, but if the fracture is all the way on the floor, that's when you say no. Barry:	Yeah. It's getting to be wishful thinking. Howard:	I want to ask you another thing regarding fractures. Some people think that you need a CBCT of a molar before you do the root canal. Talk about CBCTs because, number one, it's $100,000. Not everyone has access to it. My question to you specifically is to be a great endodontist like you, do I need a CBCT or access to a CBCT and how often are you taking one? Barry:	We've got a CB CT.
Howard:	What did you get? Barry:	What's the one? The one from Japan that starts with ... What is it, M? I just can't think of the name, but it was the expensive one. It was the very good, expensive one and it works well. Thank God, I got dental assistants because they know how to use it. I know how to read the results. I [inaudible 01:02:32] remember all the steps to actually do it. What it gives you, one, it gives you a very good picture, especially when you're going coronal apically, if there are, if there is an MB2 or if there is a middle mesial on a lower molar. It gives you definitive information on that. The other thing it can do is it can tell you if you've got root resorption, just where they are and what the extent of it is because many times, the periapical will give you a much more benign looking picture than what the CBC does. You'll see some things with the CBCT that really tells you that the tooth is not restoreable. Then there are artifacts. I had a case just the other day where I swore I was going to do a root canal on a lower molar because on the periapical X-ray, it was a little hint of something, but it was big bony trabeculations. In other words, there was radiolucences just tied to the large trabeculations. Anyway, make a long story short, I do the CBCT. I'm going through the slices. An area to my mind, my interpretation, an area clearly showed on the mesial root. Go call the dentist, say, "I think I found the problem. We're going to do the root canal next visit," since he wasn't hurting that much. I said, "You know what let's really make sure you need this. If I'm right, I don't think you're going to have any pain when I drill in without anesthesia," after all, there's an area on the root. Anyway, make a long story short, as soon as I drill down without anesthesia, he started having some pain. Took another look at the X-ray and now I interpret it with the light of the fact that he had instantaneous pain, I interpreted that as large bony trabeculations. Told him, "Look, I could still be wrong," but I didn't want to do a root canal if he doesn't need a root canal. To me, that's one of the things you want to avoid. You don't want to do root canal where it's not necessary. He wasn't hurting with an iota. Sometimes, it gives you information that doesn't necessarily guide you to the correct diagnosis. Howard:	The best root canal filling for a tooth is the original pulp tissue, correct? Howard:	What percent of the molars are you taking a CBCT on? Barry:	Honest to God, not too many, not too many. I'd say 15%. Howard:	What makes you ... ? Barry:	Most of it are retreatments. Howard:	Can I pin you down and say that you are using a CBCT for retreatments, not initial? Barry:	I use it the most for retreatments. I think that would be an accurate way of saying it. Howard:	Use it the most for retreatments. Barry:	Yeah, because I'm not doing it on the majority of the teeth. Howard:	Also you opened up another can of worms so I got to go into overtime, triple overtime with you. You said resorption. Explain to the viewers the difference between internal resorption, external resorption, and what your thoughts on as an endodontist how you approach those differently or the same? Barry:	Yeah, yeah. If I've got internal resorption and it hasn't perforate the root, I get the pulp out, the problem's done with. I'm in good shape because that thing will only progress as long as you've got vital tissue in the canal. External resorption is a whole different can of worms. It starts externally. You can try and clean it out. You hope it hasn't hit the pulp. In fact, one of the ways to differentiate it is if you see an area of resorption that's over the pulp, but you can still see the original outlines of the pulp, that's external resorption. Internal resorption actually widens the entire pulpal space. Howard:	The entire from apex to ... ? Barry:	No, no, no. It's wherever it is, it could be a balloon. It could be like aneurysm. Barry:	If you would picture an aneurysm. Howard:	Is external resorption, do you still that's mostly trauma? Barry:	Trauma, periodontal disease can cause it. Usually, it happens around the cervical level. It's interesting that I just saw, I attended this conference on pulpal regeneration, and it showed the resolution of external resorption by opening the canal and placing a triple antibiotic paste, not Dr. Grossman's old triple antibiotic, a new one. It showed resolution of the resorption, which was amazing to me. It's only one example so, there's a lot to learn in that department. Howard:	Internal resorption, you'll do a root canal, problem solved because there's no pulp tissue. There's no more resorption. What about external resorption? Barry:	If the external resorption went into the nerve, I can clean it out. I can clean out all this kind of cheesy dentin that's developed, do the root canal, fill it up with like a Geristore, and keep my fingers crossed. Also, you can use TCA, trichloroacetic acid, 90% of that. Hopefully, it kills the cells. Then put in your Geristore. It's still a little bit of wishful thinking. Howard:	I want to ask you some more questions. I'm just going through so many questions I've seen from Dentaltown. Howard:	Some people when they get done with the root canal, they were basically treating a bacterial infection. Who knows? Maybe 100 years now, they'll find out it's not just bacteria. Who knows? There could be virus, fungi, who knows what's going on? Some people will just fill the canal with bleach and set the patient up and let it soak in there. I remember 10 years ago, Buchanan said he used to do that, let them sit there for an hour. Howard:	Then other people are filling up the canal with bleach and then going in with like an ultrasonic vibrators and agitation and all that stuff. What are your thoughts about that? Barry:	I think you have to use sodium hypochlorite because it's the only thing available that digest tissue. I think it's good if you activate it. One of the things I might add when you do our SafeSiders, don't forget that instrument is oscillating 3,000 to 4,000 cycles per minute [inaudible 01:08:56] so it's pretty good activator of the solutions that you put it, but we have to be aware whether you're using 6% sodium hypochlorite, even 3% sodium ... 17% EDTA. These liquids have the potential to weaken the dentinal walls. That's why they say if you keep calcium hydroxide in the tooth for five weeks, you may have reduced the bacteria, but you've also attacked the dentin quite aggressively. Howard:	The other one, some people, on using an obturation, single carrier device, like a Thermofill. Howard:	I think another one is Softcore where you have a carrier. You heat up the gutta percha. You single place. For an endodontist, does that make it harder for you retreat? Do you like that obturation? What are your thoughts on that? Barry:	The traditional carrier base systems represent hell. They take something that could've been much simpler and made it much more difficult, but what I don't like is the fact that when you do a single point obturation on a [carrier 01:10:35], it's again heated up. It's going to cool. You put this in. You've got at one point a fit. It cools. It shrinks back. I don't see it. All these systems almost ironically require minimal use of cement because you've occluded your coronal escape route. If you put a lot of cement in the canal, you're going to push it over the apex. Nobody wants to do that so you use very little cement. Then you say it's almost trust in God that you got a uniform layer of cement between the gutta percha and the wall of the tooth. I don't see it. I don't see it, that plus shrinkage. Then you have the other part, let's say [you coat the point 01:11:20], you get denudation and the carrier is exposed as you push it ... You've heard of that phenomenon. Barry:	It just doesn't make sense to me. Endodontics I believe became one of the great commercial outlets for the major companies and it must be so because that's why they keep innovating new products every six months. If it's not instrumentation, it's obturation. If it's not obturation, it's access. It's constantly, constantly being innovated because there's money in it. Howard:	Big money, big money. Barry:	Yeah. You could ask the natural question, what makes me any different? I'm not doing it just for love. I'm doing it for money, but there's a difference between ... I really believe, first of all, there's a [personality 01:12:12] just based on nature, but there's a difference between a small company run by dentists. I'm not a bean counter. I really want things to work. I do exactly in my office what we've developed in the products. I'm not trying to sell something that I don't want to use. I really wanted it for myself. It's all a question of degree. We all want to make money, but do I want to be a multi-billionaire who controls elections and decides who's going to be running for the presidency. I don't have those ambitions. Howard:	You're from New York. You got to be the Donald Trump of endodontics. Barry:	No, no. I'm perfectly happy to be known as conjectural, but I also more importantly, I want to be one who's really open to complete wide open discussions. Howard:	You are. I love you to death. Howard:	I love you to death. I respect you to death. I think you're a legend in endodontics. If anybody's in Manhattan, I swear to God, you don't have to ask Barry on this deal. If you walk in his office, it's open seven days a week. Everybody there is ... If you want to find his office, it's manhattanendodonticsspecialist.com, manhattanendodonticsspecialist.com. Barry's website, Essential Dental Systems is edsdental.com or essentialdentalsystems.com. Is your email, are you still ... ? You're giving away your age. Your email's still AOL. Howard:	It's mdkd? What's mdkd? Howard:	Endo@aol.com. I think there's only three people left on earth that have an AOL email, Barry. Barry:	I'm probably one of them. Howard:	You got to be that young hipster guy and get a barry@gmail.com, but anyway, Barry, I took you into triple overtime. This is the longest podcast I've ever done. It's an hour and 15 minutes. Love you to death. Thank you so much for taking an hour and 15 minutes out of your busy life. Barry:	Thank you for the opportunity to express some of my opinions. I really appreciate it. Howard:	How do you prefer our listeners who have a question for you? How do you prefer? You prefer email, phone, your website? What do you prefer? Barry:	I've got Dave here who's my ... What's the best way for them to ask ... ? Barry:	Yeah, yeah, do mdkdendo@aol.com and I'm always looking at it anyway and I love answering questions. I'm also very active on LinkedIn. People want to ask questions there, but yeah, I would say mdkdendo's probably the most direct. Howard:	All right. Love you to death and I'll see you the next time I'm in Manhattan. Barry:	All right, look forward to it. Thanks.